M42 Mount lens to Olympus/Panasonic micro 4/3(Micro Four thirds)adapter. It is for Olympus PEN E-P1 P2 P3 P5 E-PL1 PL1s PL2 PL3 PL5 PL6 E-PM1 PM2 OM-D E-M5 E-M1 Panasonic Lumix DMC-GH1 GH2 GH3 GX7 G1 G2 G10 G3 G5 G6 GF1 GF2 GF3 GF5 GF6 GX1 GM. There are no electrical contacts in the adapter ring. Exposure and focus has to be adjusted manually. Auto focus (AF) is not available. With precise design and high technology.Made of brass and aluminum (not plastic); Smooth surface for effortless mount; Anodized aluminum construction; Infinity focus allowed. 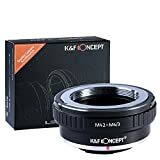 The K&F Concept lens mount adapter is made with high standard precision.It’s all metal design and polished surface is designed to guarantee smooth mounting and long lasting experiences. • Lens Mount Adapters allow you to use your lenses on the film/digital camera body; Sharing lenses has some distinct advantages. • Directly adjust aperture on the adapter, not change your lens’s numerical. • Focus infinity in manually.Install, remove and operate lens smoothly. • Made of brass, anodized aluminum camera body mount, smooth surface finishing. This entry was posted in Discount Photography and tagged 3K&F, Adapter, Camera, Concept, four, lens, M42M4/3, Micro, Mount, Screw, System, thirds by Ball Photo. Bookmark the permalink.